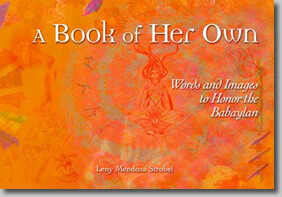 A BOOK OF HER OWN: WORDS AND IMAGES TO HONOR THE BABAYLAN is a mosaic of poems, reflections, found texts, essays, and images that attempts to answer the question: what do you do after you decolonize?Leny Mendoza Strobel continues her research and insight on the process of decolonization, which she first wrote about in Coming Full Circle.She is Assistant Professor in the American Multicultural Studies Department at Sonoma State University in California. In this book, she maps her journey and writes of her unfolding realization that her life need not be overdetermined by dualisms and ideologies; that it is possible to live a joy-filled and peaceful life while always acting with others in the daily constant struggle to be human. She acknowledges, with a great depth of gratitude, the revolutionary spirit and wisdom of the Filipina Babaylan whose legacy continues to inspire today. That spirit fills these pages.